Always a tough question for a conlanger. Not existence, of course, but the copula, and how to deal with it. The sentences above translate the same way, but mean slightly different things. In (5), está is used to indicate that the house is dirty at the moment and could use some cleaning. 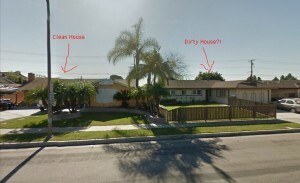 In (4), on the other hand, es is used to indicate that that house is just a dirty, dirty house. 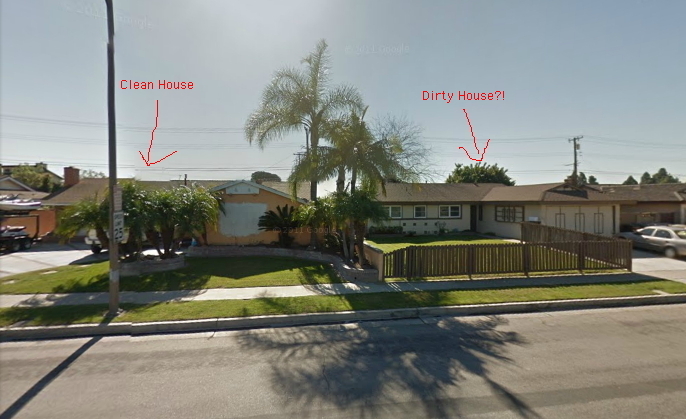 Reminds me of when I used to walk to school past these two houses that my friends and I would call the Clean House and the Dirty House. The contrast was just too stark—and it never changed: the Dirty House was always dirty; the Clean House was always clean. In fact, can we get a shot of those houses, Google Street View? Ki fin yeni?! Dirty House be clean now! How about that… Must be under new ownership. Trust me, though: the contrast was quite apparent, like…fifteen years ago. Anyway, the contrast in Spanish is between more or less permanent states and temporary ones (or status vs. state). Other languages draw a distinction between identity constructions and locative constructions (a lot of creole languages do this), or stative predicates (things usually translated by “be + adjective” in English) or other standard copular constructions. That’s not the topic of discussion today. Today I wanted to talk about the form of the copula construction. …the copula (of the wazan k-w-n) reasserts itself to indicate that the expression is past tense (the object is also marked with the accusative). This also happens in Russian (another well-known zero copula language). Some languages, though, never have a copula in any tense, and simply use the same expression in all contexts. This is kind of a status vs. state distinction, as in Spanish, except that the standard construction in (10) (using the stative verb) can be used for both a state and a status (i.e. for saying something is, at the moment, spotted [say it got splattered with mud], or for saying that something [say, a toad] is spotted all the time), and the latter can only be used with status statements. Future Allative Me khalaan. He will be khal. Present Nominative Me khal. He is khal. Past Ablative Me khaloon. He was/used to be khal. Seems like a nice neat system, but it didn’t come out of nowhere. In fact, this tripartite system derives from an older innovation from when Dothraki was a true zero copula language (and, well, it still is, I suppose, but it started to develop some copula-like constructions). In the modern form of the language when the word order changed, the verbs were simply dropped, since they weren’t necessary to express the content. Even so, these verbs can be reintroduced (in their original verb-initial position) in the modern language if further clarity is demanded. Ma anha dothra Qarthoon heshjim, ma anha arthas lajakasaraan. Mori lajish k’athvezhvenari, vosma anha drozh mora nakhaan. Irge vilajeri, fansa anni laz vos irvoso k’athnithmenari, majin anha fono chiories jimmoon, zhey Fenni. Me koalakeesi. And I rode southwest from Qarth, and I encountered a group of warriors. They fought bravely, but I slew them all. After the battle, my dapple couldn’t trot without pain, so I sought out a woman from the west named Fenni. She was a healer. Even in English, in fact, you could translate that in the present tense, given the appropriate context (so not in a novel, but if your listener was immediately on hand, “She’s a healer” is fine [or if it’s in the near past and the woman in question is still alive]). In fact, if one were, instead, to say Me koalakeesisoon, it would mean, in that context, she used to be (but no longer is) a healer. That’s about all there is to copulae in Dothraki. If you haven’t got anything else to do, feel free to enjoy this fine song about Hamlet. Posted on December 1, 2011, in Grammar and tagged detailed, etymology, history. Bookmark the permalink. 8 Comments. Is there a specific reason for why you use the word koalakeesi rather than just koalak? Is there a tradition of using gender specific words like that for females and does that mean the agentive (koalak) is generally seen as a male form? Does this apply to other agentives as well when referring to a woman? That doesn’t apply generally, but it does apply to koalak. And this, I believe, comes from A Dance with Dragons, if I’m remembering right (it’s described therein that female healers practice different arts from male healers. Pretty sure that’s ADWD). Also…That’s a new use for the vocative particle “zhey” isn’t it? Because in that example it’s not used in a direct adress. Is it just in that specific use that “zhey” fills the role of “called” or is there more meaning to the word “zhey” than we know so far? I’ve been using it that way, at least. It’s handy. It’s not properly vocative (not sure if this “called” thing is called anything at all), but it works that way well enough. I like it very much, nice neat system for a zero copula. I like the use of allative and ablative the Dothraki has for this sort of things. About the “zhey”, it sounds to me as if the use of that was rather colloquial, right? I mean, I could see it working as: “I ran into my friend, Martin, and we got a cup of coffee”, so there “Martin” could be in a vocative. Yeah, that sounds right. So it’s not just vocative, it’s also a naming particle. So does that mean it should be used any time you state someone’s name or epithet or are there time when you say a name etc and not use it? We need to do a Conlangery episode on copulas and zero-copula structures. I for one have an annoying tendency to simply create a copula verb and be done with it, despite being exposed to such languages as Mandarin (which has a copula for nominal predicates but turns predicate adjectives into stative verbs) and otherwise knowing better.